Mozilla has long played an important role in the online world, and we’re proud of the impact we’ve had. But we want to do even more, and that means exploring ways to keep you safe beyond the browser’s reach. Across numerous studies we’ve consistently heard from our users that they want Firefox to protect their privacy on public networks like cafes and airports. With that in mind, over the next few months we will be running an experiment in which we’ll offer a virtual private network (VPN) service to a small group of Firefox users. This experiment is also important to Mozilla’s future. We believe that an innovative, vibrant, and sustainable Mozilla is critical to the future of the open Internet, and we plan to be here over the long haul. To do that with confidence we also need to have diverse sources of revenue. For some time now Mozilla has largely been funded by our search partnerships. With this VPN experiment which kicks off Wednesday, October 24th, we’re starting the process of exploring new, additional sources of revenue that align with our mission. A VPN is an online service and a piece of software that work together to secure your internet connection against monitoring and eavesdropping. By encrypting all your internet traffic and routing it through a secure server, a VPN prevents your ISP (internet service provider), school, or government from seeing which websites you visit and tracing your online activity back to your IP address. A VPN can also offer valuable peace of mind when you’re using an unsecured public Wi-Fi network, like the one at the airport or your local coffee shop. 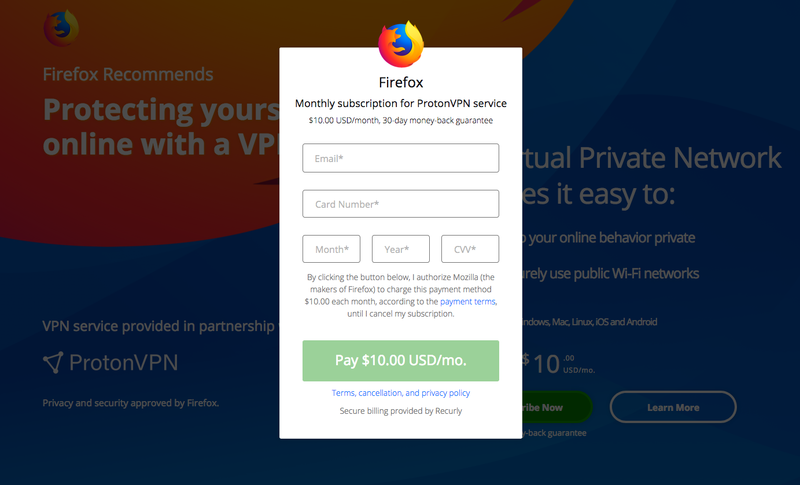 A small, random group of US-based Firefox users will be presented with an offer to purchase a monthly subscription to a VPN service that’s been vetted and approved by Mozilla. After signing up for a subscription (billed securely using payment services Stripe and Recurly) they will be able to download and install the VPN software. Windows, macOS, Linux, iOS, and Android are all supported. The VPN can be easily turned on or off as needed, and the subscription can be cancelled at any time. Using a VPN service means placing a great deal of trust in its provider because you depend upon both the safety of its technology and its commitment to protecting your privacy. There are many VPN vendors out there, but not all of them are created equal. We knew that we could only offer our users a VPN product if it met or exceeded our most rigorous standards. We also knew that the practices, policies, and character of these vendors would be just as important in our decision. We therefore set out to conduct a thorough evaluation of a long list of market-leading VPN services. Our team looked closely at a wide variety of factors, ranging from the design and implementation of each VPN service and its accompanying software, to the security of the vendor’s own network and internal systems. We examined each vendors’ privacy and data retention policies to ensure they logged as little user data as possible. And we considered numerous other factors, including local privacy laws, company track record, transparency, and quality of support. 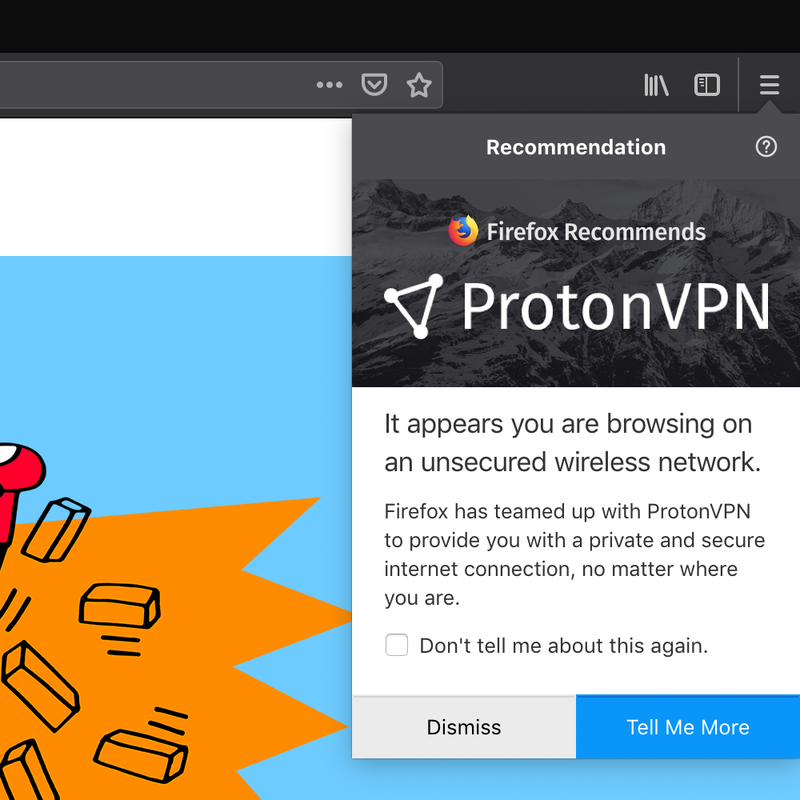 Mozilla has partnered with ProtonVPN to build a shared service. Mozilla will promote and service user subscriptions, and ProtonVPN will fulfill the VPN service and provide technical support. Together we will share proceeds from this experiment. The service will cost $10/month, which matches ProtonVPN’s regular monthly price for their “Plus” plan. 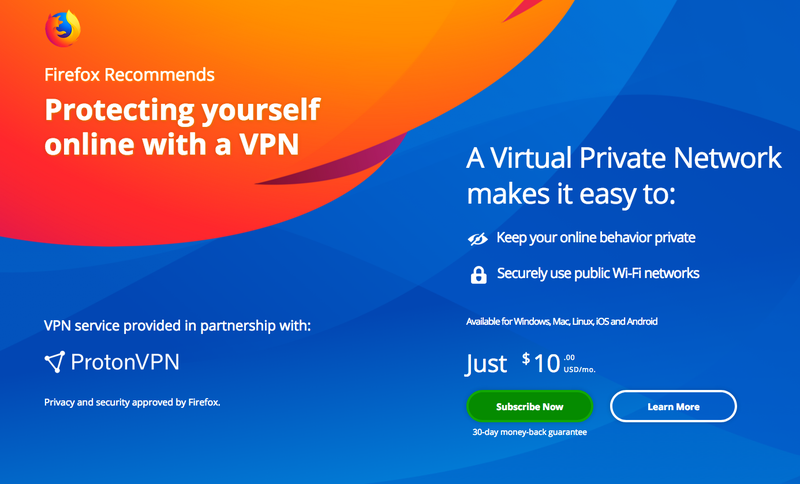 In this way, subscribers will be directly supporting Mozilla while benefiting from one of the very best VPN services on the market today. We’re looking forward to this experiment and we are excited to bring the protection of a VPN to more people. We’ll be watching both user and community feedback closely as this experiment runs.